Almost pulled right from Star Trek, the Toshiba e310 is the thinnest Pocket PC ever to hit the market with specifications comparable to the top devices on the market. The e310 packages power into a simple, small, go anywhere design and is also priced affordably. This is only Toshiba's second PDA and Toshiba is already moving up the list as being one of the better PDA manufactures. The PDA market is always moving in two directions: thinner and better performance. The Toshiba e310 captures almost top of the line specifications and is the thinnest Pocket PC device on the market. The last Windows based PDA that was on the market that was of comparable size was the Compaq Aero 1550. The e310 is a long way from the Aero 1550 with its 206mhz processor, 32mb of memory, 16-bit color screen, and SD slot. Though the performance side of the device is great, what is probably causing the interest in this device is that it is less then a half an inch thick. The price tag is also particularly attractive with an initial MSRP of $399. The e310 shows that Toshiba hopes to bring innovation to the PDA market. They have risen the bar, challenging other manufactures to remember that size is important and there is no reason for bulked up devices. 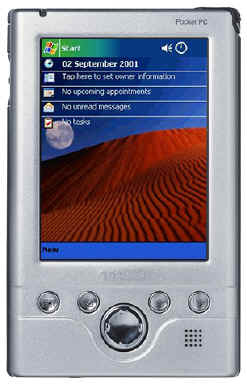 The Toshiba e310 runs Microsoft's Pocket PC 2002 operating system and is available in stores now as well as from e-retailers.